I am delighted to welcome Patience Griffin back to the Romance Dish today. As many of you know, I fell head over heels for Patience's 2014 debut novel, To Scotland With Love, the book that ended up on both Janga's and my "Best of 2014" lists; the same book that is a double finalist for this year's Romance Writers of America RITA® award. 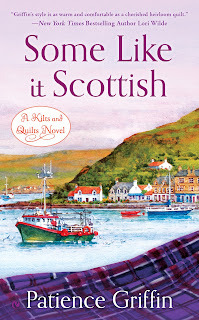 The second book in her Kilts and Quilts series, Meet Me in Scotland was released earlier this year and the third book, Some Like it Scottish comes out July 7th. I've read an advanced copy and it's terrific. It's lighter in tone than the first two without losing any of the emotion that I so enjoyed in Griffin's previous books and I'm not ashamed to admit that I fell head over heels for the hero, Ramsay. Falling head over heels seems to be something I do often with Griffin's books! 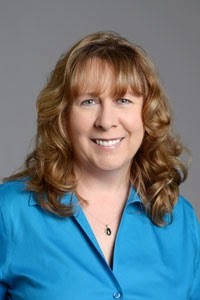 If you haven't discovered Patience Griffin's books yet, be sure to visit her website for all the pertinent information and catch up with her online at the links below. Adult coloring books are all the craze right now, and rightly so. Coloring is a great stress reliever. But I say, let’s not underestimate the power of looking at pictures. When I was a girl, my dad brought home two huge bags from Waldenbooks. This was nothing new for my dad, but included in those bags this time were two art photography books that changed my world. The tomes contained pictures of ordinary people, doing ordinary things, but something about those pictures, while I turned the pages, mesmerized me, opening up a whole new world. I was like Dorothy stepping into Oz, going from black and white into a Technicolor world in two seconds flat. Through those pictures, my world expanded. I’m from a small town. When I say small, I mean one-four-way-stop-sign-and-600-people small. Think Mayberry RFD small. Our area was so rural that all the surrounding little towns were bussed out to a country school. It was the best place in the world to grow up, seriously, the best! But what I saw in those photography books, made me grow in my perspective and made my imagination spin with new ideas. As I poured over the photographs, I began to make up stories about the people in the pictures and what their lives were like. I wonder now if that wasn’t the beginning of me becoming a storyteller. The first thing I do when I start a new manuscript is pull out a stack of magazines along with a pair of scissors. I cut out anything that causes a spark and catches my fancy. I don’t think about the story I’m going to write, I’m only looking for pictures that I love. Before I can even glue them on the poster board, I start hearing snippets of dialogue …aye, in Scottish accents, of course. I have a lot of fun making my storyboards, but I usually quit before they are complete, because I’m so full of ideas that I’m antsy to start writing the story. My love of gazing at pictures isn’t limited to my writing life. When my quilting magazines and quilt catalogues arrive in the mail, I get almost giddy. I love to sit down late in the evening when my brain is fried and flip through the pages, letting my creative-self pretend I have time to make all those beautiful quilts. And to me, each quilt tells a story. I have used fabric many times to tell the story of gratitude, like when my eldest son was a teen and developed a heart condition. To thank the cardiologists, I made a wall hanging, expressing our family’s gratitude for taking care of him. 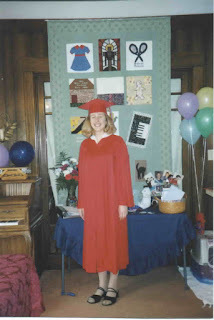 Sometimes, I’ve told the story through quilt blocks like when I made my daughter’s graduation quilt—her life in fabric. 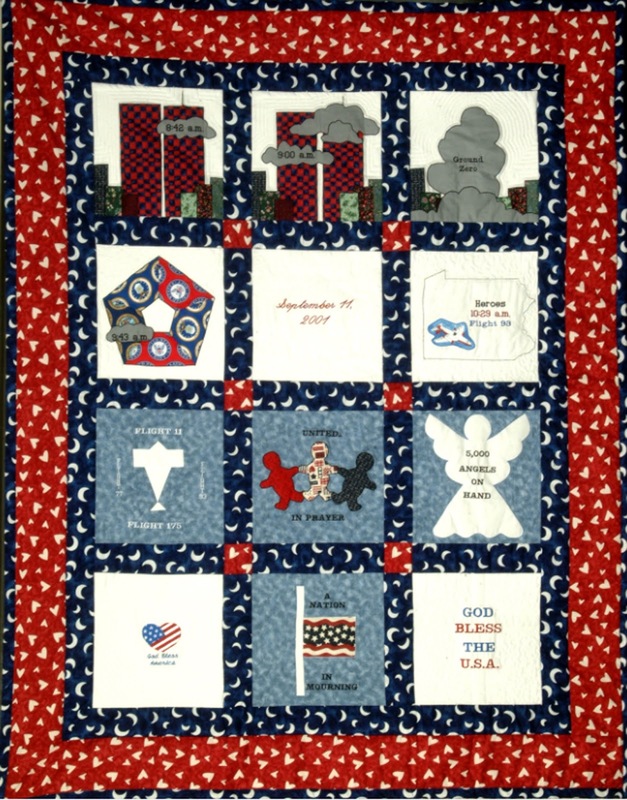 Other times, like my September 11th quilt, I told the story of the day. As far as I’m concerned, quilt blocks are simply pictures projected through a different medium. Finally, book covers, another kind of picture, catches the flavor of a story, giving us a preview of the emotion we’re going to feel when reading the book. Deborah Chabrian, the artist who has painted the covers for the Kilts and Quilts series, has done a brilliant job of conveying what I hope readers get out of my books…that feeling of home, heart, and community. And for those of you who have a picture addiction as I do, then beware of Pinterest. OMG! Once I get started, I can’t stop browsing. There is a reason I don’t spend much time on Pinterest these days…I have books to write. My grandfather had a subscription to National Geographic when I was a kid. I used to love sitting down with his latest one. Do you have a favorite magazine that you love to browse through for pictures? I love this series Patience. How beautiful your quilts are. Quilting is something I wished I had learned. It's a brilliant way to tell a story. Thanks for all the giveaway opportunities. 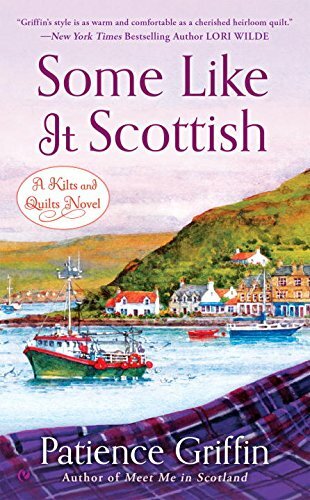 Carol, I'm so glad you're enjoying the Kilts and Quilts series. I'm having a great time writing it. And I agree with PJ that it's never too late! My cousin and I are the same age and she has recently started taking quilting classes. I'm so proud of her. Patience, this is a great interview! I, too, turn to pictures to spark ideas for my books. I've got multiple boards for each book...it is seriously addicting! But I've also found pictures that inspired whole scenes, so not something I'll give up willingly. Your quilts are so beautiful. You're a lovely woman, so talented, and gifted when it comes to storytelling. As you know, I LOVED the first book. Just finished the second one recently, and it's amazing. Can't wait for the next one! I'm so glad you popped by. So what do you do with your storyboards when you're done writing a story? Mine are piling up, but I love them and can't get rid of them...not yet. They are kind of like all the books I love. My house runneth over! I hope you love Some Like It Scottish. Ramsay, the hero, is quite the tease. Have a wonderful day! Oh, how I love books set in Scotland. I got to visit Scotland last year, and it was so much fun to visit the setting of many of my favorite books! As for creative juices, music inspires, motivates, and energizes me. I love music! Besides inspiring me, it helps with housework! I get so much more done if I crank up the tunes and sing (and possibly dance) my way through chores. Yeah for music! I'm a huge Kilts and Quilts fan. The series became an autobuy for me as soon as I read To Scotland with Love. I eagerly await Some Like It Scottish. Gorgeous quilts, Patience! Are you familiar with Anna Grossnickle Hines's quilts and poems books: Winter Lights, Pieces, and Peaceful Pieces? I love them. Both my grandmothers were quilters. I wish I had learned from them, but the closest I have come to quilting is to make the heroine of my first (unpublished) book a fabric artist whose specialty is art quilts. Ahhh...autobuy? Bless you. Talk about music to my ears. 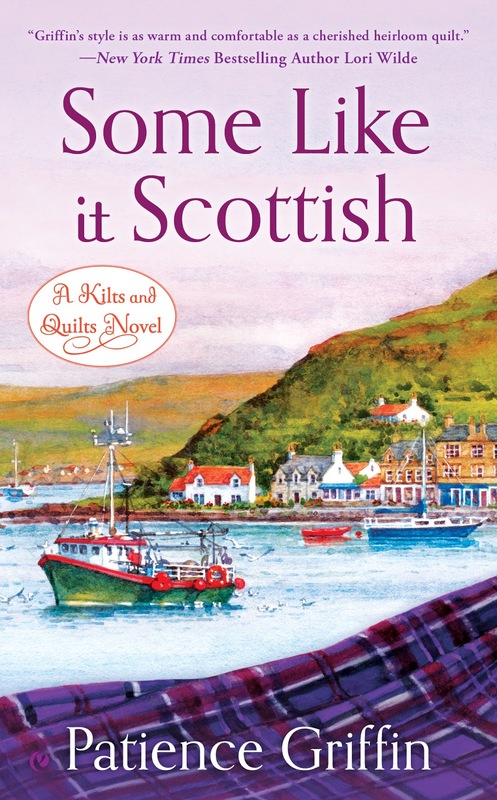 I'm having so much fun writing the Kilts and Quilts series, and I'm so happy that you're enjoying it. You and PJ have been awesome supporters. It's people like you two and my other wonderful readers who help me get through the tougher moments when I'm sitting alone with my laptop. Thank you! I was not familiar with Anna Grossnickle Hines, but I am now! I have a couple of children's quilt books, but it looks like I have a new one to order for me and my grandbabies. Art quilts are amazing...way out of my league. 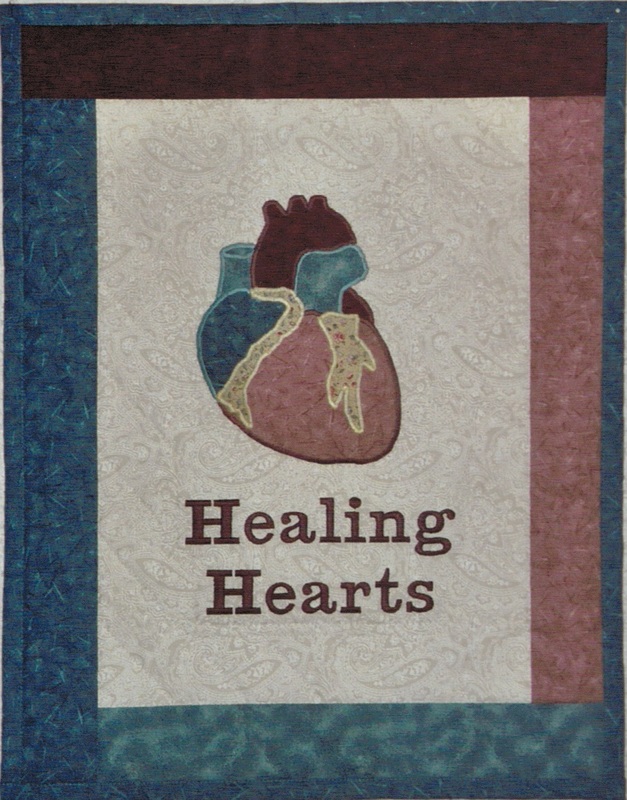 I have the Replique Quilts book which I used to make the Healing Hearts quilt above. Here's the link, in case, you want to take a look. And as PJ said above, it's never too late to learn. What a great idea! I have a couple of Scottish cookbooks that I use for inspiration, but a magazine would be even better because I could cut out the pictures and put them on my board. I use to do so many things - crochet, needlepoint, jigsaw and crossword puzzles, knitting, etc. Mostly now it's reading and spending too much time on the internet. Love anything Scottish! I haven't crocheted in years. It used to be my favorite thing to do in the winter when I lived up North. Yes, you're right about the internet; it takes up a chunk of my time. Sometimes, I want to turn back the clock to pre-internet days, but I would miss connecting with people. And I'm with you about anything Scottish...me, too! I like reading, listening to music, watching Jeopardy and working crossword puzzles. Thanks for a fun post. Are you one of those amazing people who is good at Jeopardy? My step-mom was really good at it. I'm terrible with trivia...really. Trivial Pursuit and I don't get along. But give me a math problem and I'm all over it. I recently fell in love with crossword puzzles and go through periods of time where it's all I want to do. I would love to read Some Like It Scottish. I've read her other two books. Hi, Bonnie, thanks for stopping by. I hope you like Ramsay's and Kit's story. I really enjoyed working on it. Take care! My cousin introduced me to your first two books recently and I am looking forward to reading the next ones! Enjoyed reading this interview, too. Aren't cousins the best for books? My cousin always sends my daughter wonderful women's fiction books for Christmas and her birthday. She has a real knack. Hi Everyone! Thanks so much for stopping by today to chat with Patience and many thanks to Patience for blogging with us! I hope you will all enjoy Some Like it Scottish as much as I did. And if you haven't tried Patience's books yet, I highly recommend them! What a wonderful series and feature. I enjoy looking through travel magazines and dreaming of trips and travel. I enjoy walks which inspire me and are necessary for my health. I'm getting some great ideas here. I should get some travel magazines. It's always fun to vacation without leaving the couch. I love to walk, too. It's always good to get outside to let new ideas flow in. I have to pick my walking times though, as it's been pretty hot here in Texas lately. I find walking very inspiring too, traveler. My dog and I walk early every morning. It's my favorite time of day. Oh, and I meant to say that quilt magazines inspire me, along with pretty china. I love pretty dishes. I've very fond of pottery done by local artists. I've got piles of my Dad's old Readers Digests (which I'm reading thru & then recycling them) and his old National Geo's - when I get start going thru them it's going to be a lot harder to let them go - I always loved looking at the pictures when I was a kid - now I'm determined to read all the articles too. They do make me want to travel and to learn more about subjects (especially archaeology) that have always intrigued me. You are amazing to read through them all! I have kept a few National Geographics that are special...the first walk on the moon, the Challenger Shuttle, the Maine schooner that I traveled on when I was a kid. Just a handful, that bring me joy. We've had a subscription to National Geographic for about 25 years and still have each issue. :-) I also like cooking and travel magazines - but these days you can find so many pictures online. I loved Must Love Highlanders! Wow! I can't imagine all the beautiful National Geographic pictures you've seen over the 25 years. And you're right about the online pictures...one of the reasons I have to stay of Pinterest. I'd be pinning day and night. I'm so glad you loved Must Love Highlanders. Grace and I have been emailing this evening. She's such a wonderful writer! I haven't bought the her new book, Thomas, but I need to get to it. So many books, so little time! Have a great weekend! My parents subscribed to National Geographic when we were kids. I loved reading through the issues and learning about the world. That's probably where my love of photography originated. Patience, thanks so much for visiting with us today. I can't wait until Some Like it Scottish hits the stores so I can talk with my friends about how awesome Ramsay is! I had so much fun today hanging out with The Romance Dish-ettes! Yes, Ramsay thinks he should start himself a fan club. He's such a tease and so cheeky. But we love him anyway. Take care! I hope to see you at RWA!